Is your Kalamazoo koi pond ready for winter? Maybe not completely…not just yet anyway. Hopefully you have a pond net standing by ready to go over your pond, or you will be having one installed soon, after all, a pond net is the easy way to catch leaves and debris that find their way into your pond. But after the leaves have fallen, what’s next for your Kalamazoo koi pond? Is that it…just remove the net and hope for the best over winter? Nah. That’s not exactly the best course of action, but we do have 3 must have winter items for your Kalamazoo koi pond that will help you out. When you have pond fish that spend their winter in your Kalamazoo pond, you might get a bit concerned if they will make it through winter, or even how pond fish survive through winter. First, there needs to be a hole in the ice, so dangerous gases can escape. But don’t go out and stomp on the ice to create a hole…that can cause your fish to go into shock and possibly kill them (not what we’re looking to do here!). 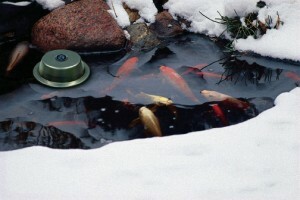 Our pond heater doesn’t heat the water, what it does is it creates a hole in the ice for you. So you can toss it in your pond, and by toss we mean gently placing it, plug it in, and let it do it’s job. You will know it’s working when the red light is on…and you’ll see the surrounding ice melted. You might even notice more birds and wildlife stopping by your pond. Your pond, and your pond fish, are in desperate need of oxygen during the winter months. The best way to add oxygen, and help remove deadly gases that build up in your pond over winter, is to install a pond aerator. A pond aerator produces a column of bubbles, which will help keep a hole in the ice open, as well as helping oxygenate your pond and helping to remove deadly gases. A pond aerator can be used year round for added circulation and oxygenation, and makes a great companion to a pond heater. Granted you probably won’t be sitting out by your pond in the middle of winter, but pond lighting can make a big difference in the winter. In winter, pond lights create a completely different effect. 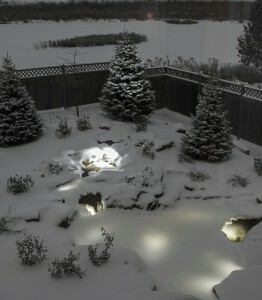 The snow and ice provide a translucent medium for the pond lights to shine through, producing a glowing quality that can’t be reproduced in summer. You will also be able to still enjoy looking at your Kalamazoo koi pond from the warmth of your home when you have pond lights in your pond, reminding you that spring and summer won’t be far away and you’ll be able to sit out by your pond soon! Be sure your pond is ready for winter by contacting us today and getting your pond heater, pond aerator, or pond lighting installed. 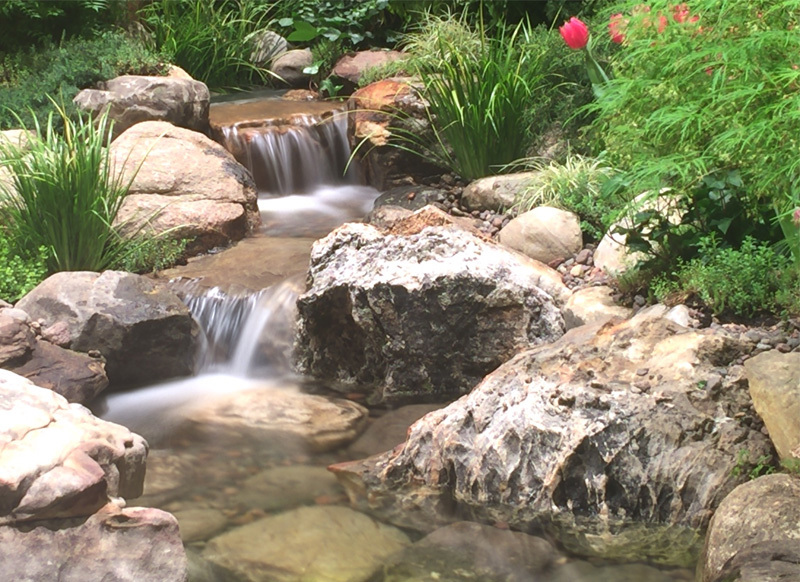 You can find answers to some common questions here, and also get inspired for your next project by visiting our water feature gallery as well as our landscaping gallery.